Is it finally time to replace your commercial roof? Before you decide on which commercial roofing replacement you want to put on your building, there are some important things you’ll want to consider. By thinking about these things, you’ll avoid choosing the wrong roof for your business. Here are 3 essential questions to ask yourself. 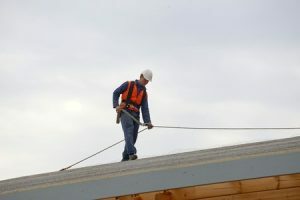 What weather conditions is your commercial roof exposed to? The weather can really take a toll on a commercial roof over the years. From the hot sun to the whipping winds, your roof needs to be able to handle whatever Mother Nature throws at it. Take a look at what kinds of weather conditions your roof will be exposed to on a regular basis before deciding on a roof. One commercial roofing replacement in Northeast Ohio might be ideal for sun exposure, while another might be perfect for a building located in a shady area. How much do you have in your budget for a commercial roofing replacement? Crunch the numbers and figure out exactly how much you can afford to pay for a commercial roofing replacement. You should consider the cost of roofing materials as well as the cost of installation. Additionally, you’ll need to think about any roof maintenance and repairs that might need to be made down the line. While putting a high-quality roof on your building is important, you shouldn’t stretch your budget too much and buy a roof you can’t afford to maintain over the years. Which company are you going to trust to put your new commercial roof on? The most important thing you’ll need to think about as far as your commercial roofing replacement is concerned is which roofing company you call on to handle the installation. Ideally, you should track down an experienced company that has replaced commercial roofs like yours in the past. They should also offer fair prices on roofs and the services you’ll need later to do roof maintenance. Ray Roofing Supply can help your company with complete roof tear-offs and commercial roof replacement. Call us at 330-452-8109 today to find out why you should choose us to replace your roofing.